There are many products when looking into solutions for a low maintence gutter system. 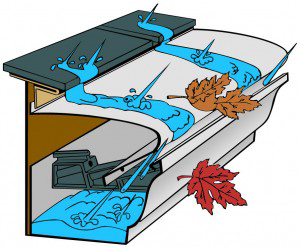 LeafProTM system is the Best Clog free gutter system on the market! We Guarantee this system to Never to Clog or we will clean inside them for free. With our system, you will never have to climb a ladder in or after a rain storm to clear those overflowing gutters again. Improperly installed standard gutter and downpipe systems can cause water damaged to your home. Leaking gutters that overflow can rot out fascia boards, soffits, siding and can cause basement leaks in your foundation. Gutter designs are very important in a roof system to make sure water is properly carried away from your homes exterior. Don't wait till these overflow issues happen to you and call for a free estimate today. This gutter system works by the principle of water adhesion using Flo Grip technology® to draw the water into the gutter and deflects the wind blown debris over the gutter not making the turn into the system. Small particles that do pass through the system exit out the 6" easy flow funnel system and into your new drainguard cleanout box. The Best Clog Free Gutter on the Market Today!